LONDON (AP) — British Prime Minister Theresa May accused the European Union on Friday of creating an “impasse” in divorce negotiations by bluntly rejecting her blueprint for Brexit, sending the value of the pound falling as worries about a chaotic U.K. exit from the EU soared. With British newspapers declaring that May had been “humiliated” by EU leaders, the prime minister used a televised statement from 10 Downing St. to insist she was prepared to take Britain out of the bloc without a deal if it did not treat the country with more respect. The pound fell 1.5 percent to $1.3066 on May’s comments, which seemed to make the prospect of an economically disruptive “no deal” Brexit more likely. May’s strong words belied her weak position: She is a prime minister without a parliamentary majority, caught between the EU and a pro-Brexit wing of her Conservative Party that threatens to oust her if she makes a compromise too far. May’s combative remarks were calibrated to appease euroskeptic Conservatives ahead of what’s likely to be a bruising annual party conference at the end of the month. 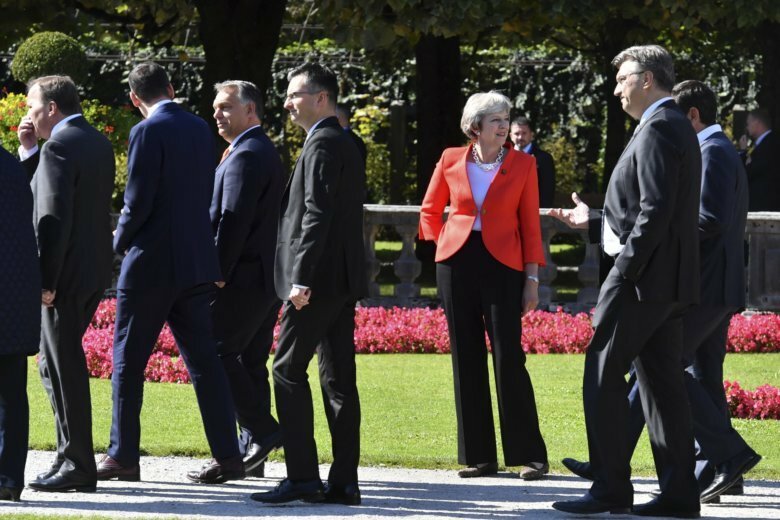 May’s statement followed a fraught EU summit in Salzburg, Austria, which dashed hopes of a breakthrough in stalled divorce talks with only six months to go until Britain leaves the bloc on March 29. European Council President Donald Tusk said at the meeting that parts of the U.K.’s plan simply “will not work.” French President Emmanuel Macron called pro-Brexit U.K. politicians “liars” who had misled the country about the costs of leaving the 28-nation bloc. UK Brexit Secretary Dominic Raab said the bloc had “yanked up the handbrake” on the negotiations. May’s “Chequers plan” — named for the prime minister’s country retreat where it was hammered out in July — aims to keep the U.K. in the EU single market for goods but not services, in order to ensure free trade with the bloc and an open border between the U.K.’s Northern Ireland and EU member Ireland. “I don’t understand why she’s failed to hear the message that the Chequers proposal wasn’t going to be accepted by the EU and frankly it’s not going to be accepted by her own party,” he said. May said a solution required “serious engagement on resolving the two big problems in the negotiations” — trade and the Irish border. Associated Press writers Danica Kirka and Carlo Piovano contributed.